What's the Difference Between Ska and Reggae? The difference between ska and reggae is subtle and nuanced, mostly involving tempo and rhythm: Reggae is slower and more laid-back, while ska is a bit punchier. Indeed, reggae evolved from ska, and the story of how both of these musical styles originated in Jamaica is quite interesting. Ska evolved in the 1960s from traditional Jamaican and pan-Caribbean genres, like mento and calypso, combined with the dramatic new influences of North American rhythm and blues, jazz, and early rock ’n’ roll. Early ska was fundamentally dancing music, and featured fast, upbeat songs in a 4/4 time signature with heavy syncopation — an emphasis on the second and fourth beats of a measure, known as the backbeat — as well as a guitar or piano line hitting the offbeat. The rhythm produced an offbeat strike known as the "skank." Ska bands tended to feature horn sections, and harmony singers were common, though the songs revolved around a lead singer's solos, with a comparable structure to the soul music that was popular in the United States at the time. Reggae didn't come about until the late 1960s, but it's important to note the oft-forgotten genre that evolved in between ska and reggae: Rocksteady. Rocksteady, popular from 1966 to 1968, saw bands slowing down song tempos and amping up booming backbeat basslines and one-drop drumlines while laying the guitar down loudly on the offbeats. Vocal harmony groups became increasingly important, with many songs being sung entirely in three-part (or more) harmony. From there, reggae evolved. With reggae, the tempo slowed down even further, and all of the elements that are instantly recognizable as fundamental pieces of Jamaican music became prominent: The syncopated bass line and the one-drop drum hit became louder, and that syncopation drove the sound of the band. The skanking guitar also increased in prominence. The horn lines, instead of following the guitar, were featured in designated spots and stayed quiet in others. Melodies were mostly delivered by a single lead singer, with harmony singers providing secondary vocal lines. Lyrics also changed quite a bit. Ska and rocksteady songs were fun, upbeat dance-friendly numbers about love and other lighthearted pursuits. Though there are certainly plenty of songs with these themes throughout reggae, reggae artists also wrote songs about politics, poverty, and religion. 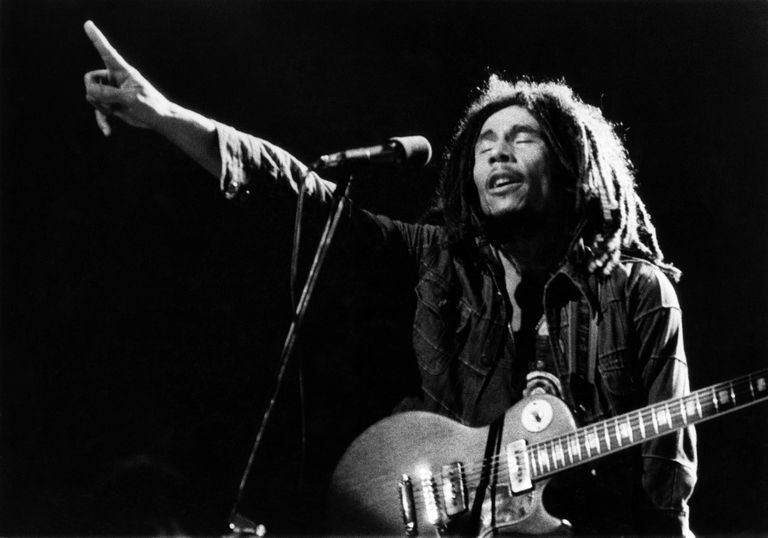 Reggae gained favor at the same time that Bob Marley converted to Rastafarianism and began the trend of talking about spirituality in lyrics. Ska and reggae are extensions of the same branch of the world music tree. Ska came first. Its lighter tempo made for fast dancing. By contrast, the uniquely Jamaican elements that characterize reggae are less heavily emphasized, though they do exist. Ska is a sort of proto-reggae, but it was also a major musical revolution unto itself. The difference between ska and earlier Jamaican mento music was far more dramatic than the difference between ska and reggae. The moral of this story is that you should be listening to more ska and reggae to truly begin to understand the differences, and similarities, between these two influential styles of Jamaican music.